Writing Our Story: Shedding the baby weight! I am officially back to my pre-baby weight! I have been wanting to blog about this for a while but I wanted to wait until I shed ALL the prego pounds first. If you keep up with my blogs or know me then you know that for the last 3.5 years I have been pregnant or breast feeding. The second I weaned Josselyn (my 1st) and shed the baby weight I found out I was pregnant again and I immediately packed on another 25 lbs with Julianna (my 2nd). I am one of those mama's who nurses diligently & exclusively for 12 months (but not a day longer). Well, this past April Julianna turned 1 year old, I weaned her and I was ready to fit back into my clothes. I am the type that loses all but about 10lbs within the first week of giving birth. That is a great thing but the problem is I have a heck of a time losing the last 10lbs. With Josselyn I held on to about 7lbs but the moment I started to wean the pounds fell off. We went on a cruise on Josselyn's 1st Birthday and I was back to my pre-baby weight (but then I found out I was pregnant again). This time I started to wean Julianna but the pounds stuck! Again, we went on a cruise when Jewel turned 1 and I half starved myself and lost maybe 2 lbs. I still had another 7-8 to lose! Now you may be thinking oh who cares about 8 lbs. Well, let me just say that when you are only 5'1 in height 8 lbs is what is keeping every pair of jeans in your closet from zipping! On our cruise I didn't dare take any pictures in my bikini and I wore my 1 piece swim suit the majority of the time or my bikini with a tank top over it. Although I am my own worst critic I like being at a place with my body/health that "I" am happy and comfortable with. I got back from the cruise and decided I wanted to really work at feeling my best and fitting back into my pre-baby clothes. I started out using some of my mom's Slim 4 Life supplements. I took "carb/sugar Slim 700 blocker" & a "metabolizer". They were working great but cost a fortune!!!! I needed something more affordable that worked the same. I kept seeing my friends post supplements & body wraps from "IT WORK'S". I transitioned to the It Works "Fat Fighter" supplement which cost $23 vs $40 at Slim4 Life and I switched to the It Works "ThermoFit" metabolizer instead which is $39 vs $150 at Slim 4 Life. The weight began to fall off but I still couldn't quite get my pre-baby jeans to zip. I decided to try out some of those crazy It Works body wraps "Ultimate Body Applicator". (Now I had some major hesitations: does it last, is it just water weight, what is in the wrap, etc and I will address those at the bottom) Anyways, It was $59 for 4 Ultimate Body Applicator wraps which I thought was pretty good! After doing the first wrap my old jeans fit! I saw a tremendous difference in my before and after picture although I didn't lose inches my 1st wrap. Basically the wrap TIGHTEN, TONED & FIRMED my stomach and I didn't do any sit-ups, crunches, or change my diet. I actually was on a McDonalds chocolate dipped ice cream cone kick lol. After being able to fit back into EVERY single pair of my pre-baby jeans I decided I was sold! I ordered a few more and started wrapping! I also fell in love with their other products! They have the best health line, full of vitamins, greens, etc. One "Greens Chew" has the antioxidant strength of 20 cartons of blue berries! Q: Do you just lose water weight with the wraps? A: The wraps are actually a detox. Our bodies need to detox the harmful substances/toxins we take in daily like (pesticides, microbes & mercury just to name a few). When you do the wraps you drink half your body weight in fluid ounces so yes you pee a ton but you are detoxing and with these botanically infused wraps you Tighten/Tone/Firm (in 45 mins). In the past I use to take water pills occasionally during my menstrual cycle to lose water weight but I never ever Tightened/Toned/Firm after peeing...did you??? So no you do not lose water weight you lose the toxins that are built up in your body! Q: Do the results from these wraps even last? A: The company says the wraps typically last 2-6 months if you do NOT change your diet/exercise routine. If you do change your diet/exercise routine the results can last longer. But as you intake toxins you do need some form of detox (which there are tons of ways to detox). They recommend doing 1-2 wraps every 8 weeks for maintenance. I personally am doing 1-2 wraps a month while I am going to be putting on a swim suit! lol But 1-2 every 8 weeks is how you can make sure to maintain. So that is around $7 a month. Q: What ingredients are in these " crazy wrap things"
A: These wraps are all natural, the non-woven cloth wrap is infused with a powerful, botanically based formula that delivers maximum tightening, toning, and firming results wherever you need them in as little as 45 minutes! The ingredients include: Water (Aqua), Glucose, Caprylic /Capric, Triglyceride, Glycerin, Alcohol Denat., Stearic Acid, Stearyl Alcohol, Ceteareth12, Aesculus hippocastanum (Horse Chestnut) Seed Extract, Urea, Centella asiatica (Hydrocotyl) Leaf Extract, Camellia sinensis (GreenTea) Leaf Extract, Fucus vesiculosus (Bladderwrack) Thalle Extract, Hedera helix (Ivy) Leaf Extract, Equisetum arvense (Horsetail) Leaf/Stem Extract, Ruscus aculeatus (Butchers Broom) Root Extract, Paullinia cupana (Guarana) Seed Extract, Simmondsia chinensis (Jojoba) Seed Oil, Decyl Oleate, Magnesium Aluminum Silicate, Glyceryl Stearate, PEG 7 Glyceryl Cocoate, Tocopheryl Acetate, TEA-Hydroiodide, Methylsilanol Mannuronate, Menthol, Camphor, Panthenol, Phenoxyethanol, Retinyl Palmitate, Triethanolamine, Carbomer, Rosmarinus officinalis (Rosemary) Leaf Oil, Eucalyptus globulus (Eucalyptus) Leaf Oil, Caprylyl Glycol, Sorbic Acid, BHT. Limonen, Linalool. Q: How does the "Fat Fighter" supplement work? A: You take the Fat Fighter after your largest meal of the day and it blocks 30%-60% of the fat & carbs in your meal! The Fat Fighter’s active ingredient, NeOpuntia, is derived from the prickly pear cactus, and it is the most powerful, gluten-free, kosher, and vegetarian fat-binding ingredient on the market today. Its natural fibers have lipopholic properties, binding to the fat from the foods in your stomach. As a result, some of the fat from the foods is not absorbed by your body,but rather excreted from your system naturally. 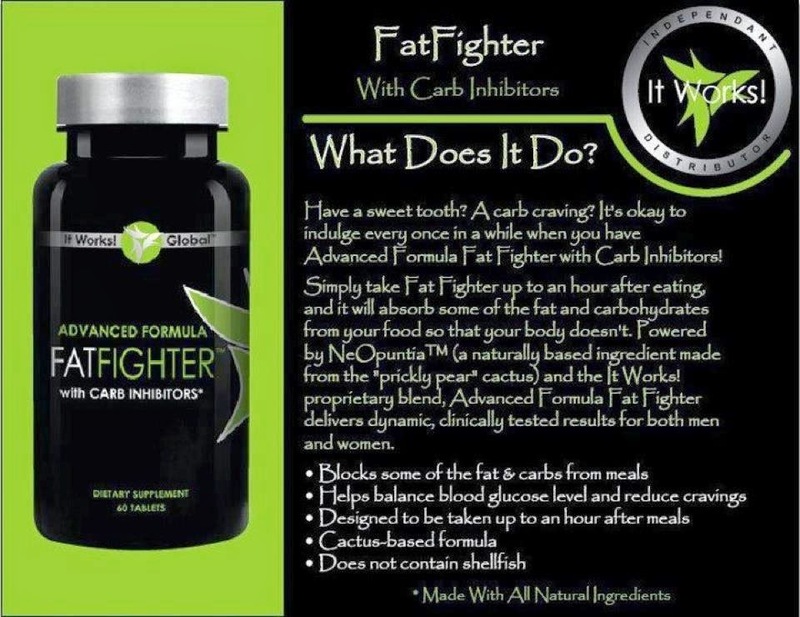 Fat Fighter also contains phaseolamin, a white kidney bean extract that acts as a carb inhibitor. The white kidney bean extract paralyzes the enzyme in your stomach that turns the starch from carbs into sugar during the digestive process. This prevents the body from absorbing some of those carbohydrates, and they are excreted naturally. Q: How does the "ThermoFit" supplement work? A: ThermoFit fires up your metabolism with its naturally based, thermogenic weight loss formula! Powered by the antioxidant superfood acai berry and the metabolism-boosting properties of Capsimax (red hot pepper blend). The Ultimate ThemoFit: Promotes increased calorie burning, helps boost metabolic rate, reduces appetite, provides energy, and has all of the antioxidant benefits of acai berry! A: The wraps retail at $99 (for 4 wraps). However anyone can get the Loyalty Customer "LC" price for FREE. The "catch" is you have to order something for 3 months. That can be any 1 item for 3 months ie: July: you order the "Ultimate Applicator Body Wraps (includes 4 wraps)" $59/August: you order the "Advanced Formula Fat Fighter" $23/ September: you order the "Its Vital Minerals" (multi vitamin) $23 and then you never have to order again (although I am sure you will!!! Or you can pay a one time $50 lifetime membership fee and then you can purchase any products at the wholesale "LC" price whenever you want. A: Duh the body wraps, Fat Fighter & ThermoFit lol But I also love the "Greens on the Go" (Berry Flavor) With the "Greens on the Go" you alkalize, energize, and detoxify wherever you go with increased energy! They improved immune system health, a clean-running digestive system, and a detoxified, pH-balanced body. Greens’ pH-balancing blend includes an acidity-fighting combination of magnesium and potassium for an alkaline body that’s healthier and more energized. A cutting-edge probiotic helps you maintain that healthy balance by keeping your digestive system regular and toxins flowing out. With the nutrition of 8+ servings of fruits and vegetables and a blend of 38 herbs and nutrient-rich superfoods, Greens provides naturally occurring vitamins, minerals, phytonutrients, and enzymes to give your already well-balanced diet a nutritional boost. Just mix, shake, and take your Greens on the Go! That is pretty impressive huh!?!? Well there you have it! Sorry if that was information overload but that is how I LOST ALL my baby weight! If you want to shop the products just go to www.sheriswraps.com and click shop and then look to the left for all the products. You can also email me at sheriswraps@yahoo.com. Although I am pretty excited about this product I promise will try not to over post on IG or Facebook haha. I am happy to find so many useful information here in the post, thanks for sharing it here.I hope you will adding more.I know something information about Weight Loss Fact that works properly. You may check it out. I hope that it will equally help you. weight loss pills are designed to be a supplement to your natural diet and are made to help you lose weight faster.